You feel that Marvel shouldn’t be able to sustain it forever, and that sooner or later the inevitable decline should be kicking in. With the big-name Marvel heroes resuming their solo careers after The Avengers (2012), the change of pace back to something more ‘ordinary’ almost begs a succession of anti-climaxes, or possibly ill-judged ever-escalating attempts to compete with the cross-over film in terms of scale and spectacle. The challenge was perhaps particularly acute with the sequel to Captain America: The First Avenger (2011). The opening instalment had pulled off the improbable task of taking the least inspiring of the Marvel big-names (on paper) and putting him in a story that was genuinely charming and clever, largely through the enjoyable oddness of a period-set superhero film and the witty examination of the captain’s original role as a propaganda icon. Yet relocating the character to the present day threatened to remove much of what had been interesting about the character in his previous titular vehicle. However, in practice there turns out to be considerable advantage in automatically preventing the perennial sequel problem of overcautiously retreading the same ground as the first. Now living in contemporary Washington D.C., Steve Rogers aka Captain America (Chris Evans) is still struggling to find his place in the modern world, and particularly within the S.H.I.E.L.D. organisation, where his noble ideals come into conflict with the more pragmatic and manipulative style of Director Nick Fury (Samuel L. Jackson). Yet soon Fury is facing ‘trust issues’ of his own, when he becomes the target of rogue assassins headed by the mysterious ‘Winter Soldier’, and before long Rogers and Natasha Romanoff aka Black Widow (Scarlett Johansson) find themselves facing a sinister conspiracy rooted in loose ends from the captain’s Second World War past. Returning writers Christopher Markus and Stephen McFeely cleverly shift the pastiche into new generic territory, specifically the 1970s Hollywood political thriller, and the most obvious result is a much more thorough and fascinating look at S.H.I.E.L.D. than has yet been accomplished. In this regard, its ‘mid-season’ status in the Marvel film series is a huge advantage, enabling it to pick up certain threads concerning the organisation’s sinister potential that lay in the background of The Avengers. Freed from the need to provide showboating set-pieces for a large cast of protagonists, it is able to develop these background themes more satisfyingly. The pastiche is particularly highlighted by the casting of Robert Redford, a veteran of such iconic political thrillers as Three Days of the Condor (1975) and All the President’s Men (1976), as senior S.H.I.E.L.D. leader Alexander Pierce. Here the narrative role that Redford used to play is displaced onto Captain America himself, effectively using and expanding the role that made him so appealing in his prior film appearances, of an innocent ‘outsider’ with a value system that often lies at odds with the institutions around him. Partnering him with Black Widow also works well, the contrast between their backgrounds and dispositions helping to provide her with a more defined and developed role than in previous appearances. And whilst the paranoia of the political thriller and the escapist thrills of the superhero film may seem at odds in many respects, the film benefits hugely from Marvel’s usual skill at pitching the tone of their projects. This provides a film that touches on intelligent and contemporary themes, whilst remaining exciting, fun and tightly-paced, comfortably blending wit and humour into the drama. 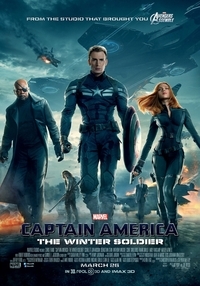 The Winter Soldier stands as one of the highlights in a film series that shows no signs of flagging yet. This review was published on March 30, 2014.